We previously reported from Indianapolis Motor Speedway regarding the unveiling of the naked EBR 1190SX. Now we have the details, including pricing and specifications from EBR. The full press release is below, and this is a no compromises streetfighter with 185 hp and 100 foot/pounds of torque. The 1190SX will be available in three colors beginning late July at a U.S. MSRP of $16,995. Visit EBR’s web site for further specifications and details. 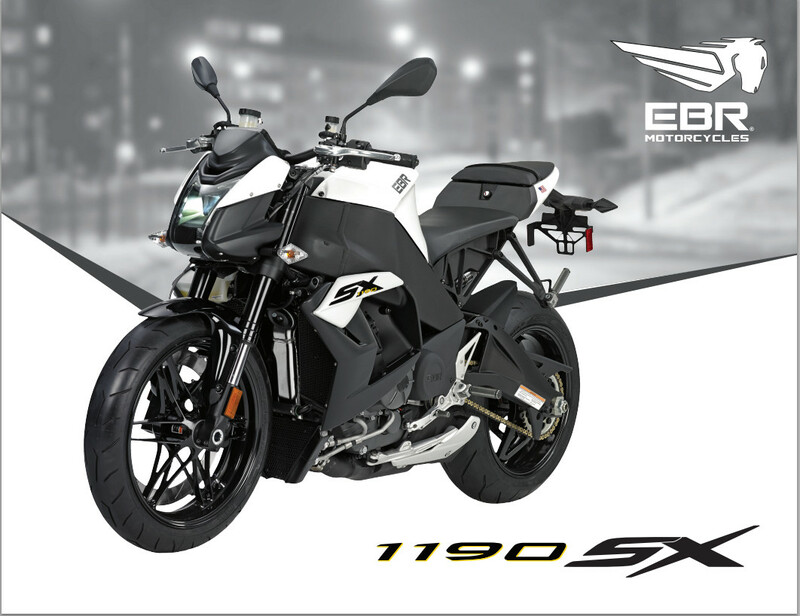 EAST TROY, Wis. – Following the successful introduction of their 1190RX superbike, Erik Buell Racing has introduced the EBR 1190SX, a true naked streetfighter-style sport bike with uncompromised Superbike race-bred performance and handling. FREEWAY POWERSPORT OUT OF EL PASO IS WORKING ON A TURBO EBR!!! As a owner of an Aprilia Tuono and a Buell XB12R this is a true naked sports rocket! I love everything about it! It is the closest thing I have seen to my XB which is the best handling bike I have even ridden. Give it a 6 speed transmission a decent clutch and a Rotax and I would gladly trade them both for it! Wonder if they’ll take a 1125CR in trade? I’d rather Keep my CR, but the mishmash wiring is annoying, but would hate to give up the belt. I would like to regear the CR to R spec also. I really wish the dealer would help keep the old Buells alive. Nice looking machine. I’m not in that financial bracket myself after taking care of life’s essentials. It must ride like a dream. I had an M2 back in the day and that handled really well. Will Buell clubs start up again? Would be nice. I just sold a TU250 and a 919 so we’ll see what replaces them. I’d need a seven year plan and a lot of $nterest payments myself. I’d also like an optional flatter sub frame though I am sure you need to keep weight over the front of this machine with that much power. Very nicely done. I’m a 6-3 “Clydesdale” (mountain bike term) who prefers comfort and as little maintenance as possible. I’d be happier with BMW’s latest R1200 Evo-whatever thingy. But if I was a normal sized rider close to EBR service center, this 1190SX would be sweet. Wow, this 1190SX really “contracts” the definition for “padding” in the context of a motorcycle seat! Dealers might consider buying a replacement OEM seat pan and displaying it with OEM-type cover material over padding thickness 2-4x the OEM spec. Man, I’m turning into my father. I can’t see paying just about for a bike as I did for my car. I can see it, I just can’t DO it…. i GLADLY pay MORE for bikes than i do cars. and really, what’s so special about a car, my mum drives one doesn’t she…? look around in the 1st world and you can see hundreds if not THOUSANDS of cars on any given day. can’t throw a rock without hitting one…? no seriously don’t do that, you’ll get into a lot of trouble. That seat does look like a torture rack and it would be a minority of riders that could go 300 miles and still be smiling. Most riders would prefer a real seat, even if it wasn’t quite so aesthetically pleasing. Above post is a response to Tim’s post and his claims of seat comfort. Based on Tim’s comment, it sounds like he’s ridden this seat. Seats don’t need to be pillows to be comfortable, our asses are already soft..
I’ll take mine in white. By the way little Biaggi you’ll never catch me and you’ll never see any chicken strips on this bad boy. It’s a very appealing, unique motorcycle and I bet EBR sells everyone it can make. The photo doesn’t show the exhaust, I’m assuming it’s like the 1190Rs. I don’t get why EBR abandoned the under-body exhaust. I really like it on my 1125R. So far as street fighters go though, there’s lot’s better values out there but you give up on the exclusivity. Oh, and I prefer a belt drive, if anybody cares. Aprilias, BMWs, MV Augustas and KTMs are pretty exclusive, no? Not to worry, though. Monetary value often doesn’t play much role in that price range. It is more about performance and appearance. Tough company to be in nonetheless. Easier to make power with longer pipes, I imagine. Nope. The majority of the exhaust — the biggest, heaviest part, is still under the engine. The exhaust needed to have a higher exit point in order to meet some overseas noise regulations that were picking up sound waves bouncing off of the pavement. As a fellow Cheesehead, I don’t like the front nacelle. Almost looks shared from the Hero line which surely is not coincidence. Also another minor quip, please put the dash controls on the handlebars. Sure its cheaper not to, but really a few buttons at that price? Really hope EBR bikes take off. Seen the 1190RX at Mama Tried show in Milwaukee and think it looks great in person. Headlight nacelle really looks like an afterthought. Angular is fine, but at least give it some style! Why does a modern bike still have a naked 19th century style chain flapping around in the grit, mud and rain? Enclose the bloody thing and provide an oil bath, or use an enclosed belt or a line of enclosed gears – and come a little closer to the 21st century. While the belt drive does have some advantages ie: cleaner, quieter, less weight, making final drive gearing changes becomes a very expensive proposition (not to mention the cost at manufacturing) when compared to chain and sprocket systems. As for the oil bath and gear drive ideas the issues of complexity, weight, and frictional losses should be obvious enough. Simple, it’s the most efficient way to get power to the wheel. Modern o-ring chains do not need to be bathed in oil, enclosing it would just add weight and make tire changing more of a pain and time consuming (especially at the track), belts are bulky and a line of gears would be heavy which would increase reciprocating mass and unsprung weight which would eat power and have a negative effect on the rear suspension. Also a chain makes re-gearing very quick and simple which again is an advantage at the track. Weight, strength and resistance are likely the reasons those aren’t present. You want to be able to change gearing on a sport bike, which wouldn’t be easy with a “line of enclosed gears”, or a belt. Please report to the Touring section of the store to find your belts and shafts. For this bike’s intended mission, a chain is the best option, no question. Besides, you would need a very big belt for that kind of power. This bike is for committed and proven Hooligans – None of which would chatter about the chain. I rode a Boss Hoss. It had a belt. It weight 1200 pounds and made 500 or more HP. Belts are as strong as chains. We have them on huge industrial machines here, so I have no doubt they are strong. But I have also noticed that the higher the operating rpm, the bigger the belt is on these machines. Perhaps that doesn’t translate to motorcycle belts? In most cases I’d be with you but I have to go with the crowd on this. For a “Street Fighter”, like a pure sport bike, chains make sense. Besides, the arch conservatives who buy this kind of bike would want a chain. “I want a new bike just like my old bike but, ah, not the same, but not different”. The AX should have something better than an exposed chain but I’m not holding my breath. I like it. It looks better than it’s fully faired sibling, and MUCH better than Buells of yore. While objectively expensive, it’s in the same neighborhood as the S1000R and SuperDuke. Whether it has the chops to hang with those two (they’ve been crushing other naked bikes in most recent comparison tests I’ve read) remains to be seen. chomping at the bit for the Full Down & Dirty Comparos that are surely being planned by every mag and blog. This seems nice if you looking for this type of bike. What I notice more is the price. If the naked bike is $17K it looks like I will not be enjoying the the adventure version. I assume the AX will cost even more more than this bike, that is more than I can justify for a toy. Plus I don’t a need or have a desire to own a motorcycle with 185 HP at the crank. Maybe there will be an adventure or touring version of the 650, might be more what I’m looking for and in my price range. And still have the creative thinking that make Mr. B’s bikes so desirable. This bike has nothing to do with Supercross. ??? OK, somebody has to say it. Best comment on the article so far. That’s awesome, especially when you remember that it was done by a bunch of guys in a shop in East Troy. Well done, Mr. Buell! Compare that with the mess that is the Motus. Agreed, especially the 2014 with its improvements. I would not be surprised if some portion of Tuono owners would also own this 1190SX. Sorry to double post…I’d also not be surprised if, on any given track day, a Tuono owner or 1190SX owner was passed by someone on a superbly tuned track-prepped Suzuki SV650. I’ve seen SV650 with track times to embarrass bikes worth three to five x as much. The owners cherish the laughs they have in the pits over their antics on the track. Not on any track with anything resembling a straightaway, look at any racing organisation website to see the times. …and when that happens I always mention the new and improved version, the SFV650! Now thats a thread stopper. A professional motorcycle journalist told a story of his track day on a nice supersport street bike. Ben Bostrom passed professionals on the track that day, while Ben piloted a BMW K75…with a passenger on the back. I have been passed by sv650s on the track, while I was (so I thought) flying on a R6. However, that is the track, on not so comfortable bikes. So I guess the Ducati Monster and Triumph Speed Triple (which both preceded the S1) don’t count? Or a Brough Superior SS100? Or the 89 NT650 Honda Hawk that had under engine exhaust well before Buell. I think the ’87 Battletwin had a tucked exhaust. Or the Honda Sport 50? The Hawk GT was obviously the bike Ducati copied for the Monster. Or a 1965 Harley-Davidson Sportster XLCH. Nit-picky, but my bad. Sorry Erik. From this day forth, he shall be known as “Erick”. Now we can all get along. you sound frustrated. Go beat the gears out of a fax machine. or was that a printer? Eric, i wish you well, and not just because I’m a fellow Cheesehead. I’m hoping to hear an end to comments asking why America can’t build a competitive sportbike. Here it is, in naked and faired forms and priced right. If complaints were sales EBR will do great. The thing is, most Americans with $20k to spend don’t want a sportbike. They want something comfortable, charming, and beautiful to eat up the many long flat boring roads in America, where power and handling don’t matter. I’ve never owned or wanted a Harley, but at least I understand why someone would. I have a 2004 ZRX with low miles I payed $3500 for. It’s supposed to have 122hp which is sort of boring/frustrating because you have to be very careful where and when you wring it’s neck so it’s a rare occurrence for me when I can. Another 50% more horsepower seems silly for the street. Maybe it wouldn’t if everybody in America lived on Angles Crest Hwy, but they don’t. I suppose it’s about bragging rights to a large degree. I’m personally thinking of moving down to something like a CB650f so I can hear my bike howl more often without losing my license or my life. Everyone says they want more power, but 185 crank horse sounds a bit dangerous (though I would LOVE to try it once or twice!). It all comes down to useable power, also. If the fueling isn’t “twitchy”, but more like a linear controllable explosion at the handgrip, that would be great fun. If it is a racing style 1/4 turn to full throttle, that would be a bit hard to handle on the street for most riders. But it is NICE to have choices! And that is the best thing EBR can bring to the ol’ USA, and just in time for the 4th of July… Salute! Well, it IS silly for the street. So is your ZRX or even a CB650F for that matter. Some want that kind of power to brag, some just like to twist the throttle on a lonely road every now and then to feel what it is like to be a god, and some of like an everyday bike that won’t get swallowed up by literbikes during a track day. You can’t use 185 hp on Angeles Crest either! Honestly, $17,000 will buy a lot of nice bikes (two CBR650F’s!). The rider that buys an 1190 is getting exclusiveness and a yet to be proved record of reliability. A $17,000 bike OTD rings up close to $19,000 before you get out the door…OUCH!!! If the 1190RX is too much bike for you, you might want to wait to see the 650cc Hero that is rumored to be headed over here as a Buell model (it was designed by Buell for Hero). No, but a Toyota Corolla does have cruise control, power windows and air-conditioning? The $17,610 MSRP base model Toyota Corolla does not have cruise control. It also doesn’t have suspension with adjustable rebound, compression, and preload. It doesn’t have a slipper clutch or 21 level traction control. Nor does it have a power to weight ratio of 2.2 pounds per horsepower or a 0-60mph time of about three seconds. I am not saying a Corolla can compete from a performance standpoint anymore than this 1190 can compete from a utility standpoint, which was my point. Saying it costs the same as a Corolla doesn’t say much IMO. How it stacks up to it’s premium competition, all of which cost the same or less, will say a lot. Really looking forward to the shootout! Impressive bike nonetheless. I’m just commenting on the overall cost of the bike. In absolute terms $16K is just not a huge amount of money if this bike is the one that brings the biggest grin to your face. I agree with you that this is an impressive bike, as is the fully faired version. Ducati gets crap for the short-stroke Panigale not being torquey and EBR gets crap for the long stroke 1190s being having lower peak horsepower. I’m hoping that buyers for this class of bike are smart enough to recognize that, for street use, it’s the area under the torque curve that matters. I hope it is a big success but the Torture Rack Seat would have to go. 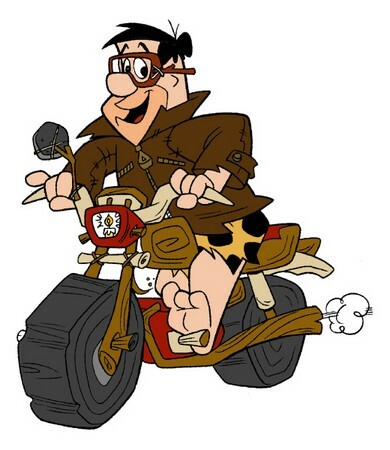 You’ll just have to be that guy with the Sargent / Corbin seat… Then the KOOL motorcyclists will know you are wise! Most “Roadsters” need a different seat or bars or mirrors etc etc – Then you take it amnd make it your own. Actually the seat is VERY comfortable, 300 to 400 miles days with no complaints at all. Sit on it, I doubt you’ll want to replace it. My only complaint about the seat would be its a bit slick when riding in textile gear. Seems to grip leather ok though. As for the cost, its right in line with other smaller manufactures superbikes. Up until last year it would have been cheaper than the Aprilia and still is cheaper than the Ducati and MV Agusta. As for the power, its the easiest liter bike to ride ever. The power has no peak or hit, it just keeps buidling in one linear line until red line. Fueling is spot on. You have to ride one in earnest to really understand just how excellent a job the EBR team has done. Reminds me of my first wide open day on the Mighty Hayabusa back in’99! I remarked that it built power like a Nuclear Reactor! The scenery did blur at 185MPH (my personal land speed record – shame too, becasue there was more capability that there was road). Yeah, but the Hayabusa only makes a paltry 160 hp. 166. At the wheel. Which is probably about 10+ more than this bike will make at the wheel. The EBR is certainly lighter by a good margin though. So you own an RX and an SX? Wow. You posted in the previous article how great the RX is to track etc. Calling B.S. here. I don’t see where he claimed to own an SX, too, at least not in this post. Posting a comment about seat comfort on a different bike model with a different riding position makes sense. Wait, no it doesn’t. Didn’t say it did make sense. Just said he didn’t claim to own an SX. I prefer to be armed with more than assumption when I choose to be a jerk, but to each his own. Can’t argue with stupid. Rock on keyboard jockey. Hah! Ain’t that the truth. Gotta love it.